4 pack finder locators are black, green, blue, pink. APP will shows where the bluetooth loss connection, this help you remind where you lost it, and find it easily. Color: 1 x black, 1 x green, 1 x blue, 1 x pink. Battery: Contains CR2032 Lithium Coin Battery (replaceable). -In the app's Camera interface, press the button once to take pictures. Key GPS tracker: Key finder uses Bluetooth 4.0 technology to connect Android, iOS, iPad and other smart phones. Show the lost car key, luggage, wallet, dogs, cats distance from you on the APP to let you find them accurately. APP control: Download free APP "cTracing" then pair it with your smart phone. The anti-lost device will make sound when you press the finder button. 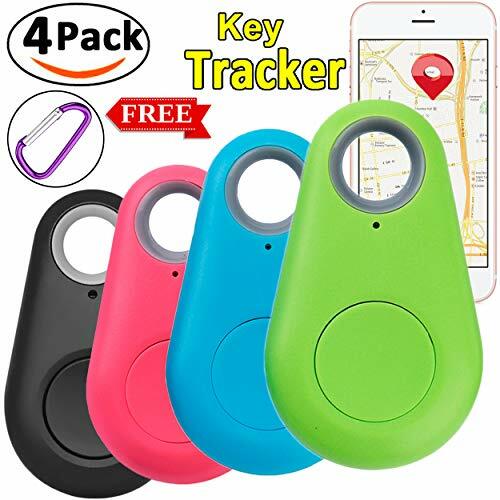 You can hear voices from bluetooth GPS tracker within 50 ft. 4 pack Key finder locator contains black, green, blue, pink for kids, pets, phone. Two-way notification: Attach this wireless tracker to anything we always forget key or wallet and keep track of them, lets you be "Beep" alarm when they are out of range with a Bluetooth finder. Form August 30, the package inclusion 4 pieces key finder and 4 FREE carabiner, other sellers do not include this carabiner and ships from Vietnam/ Italy/ China, it will arrive in your home 20-30 days and HIGHER POSTAGE. Finder keychain: Bluetooth tracker is compact size, light weight and easy to carry like a key chain on your kids schoolbag or hang on pet collar, real-time viewing Bluetooth locator effectively avoids your kids, pets are lost. Provide a last seen pin-drop on map via APP to help you recover your items and search your car in parking site. If you have any questions about this product by JingStyle, contact us by completing and submitting the form below. If you are looking for a specif part number, please include it with your message.